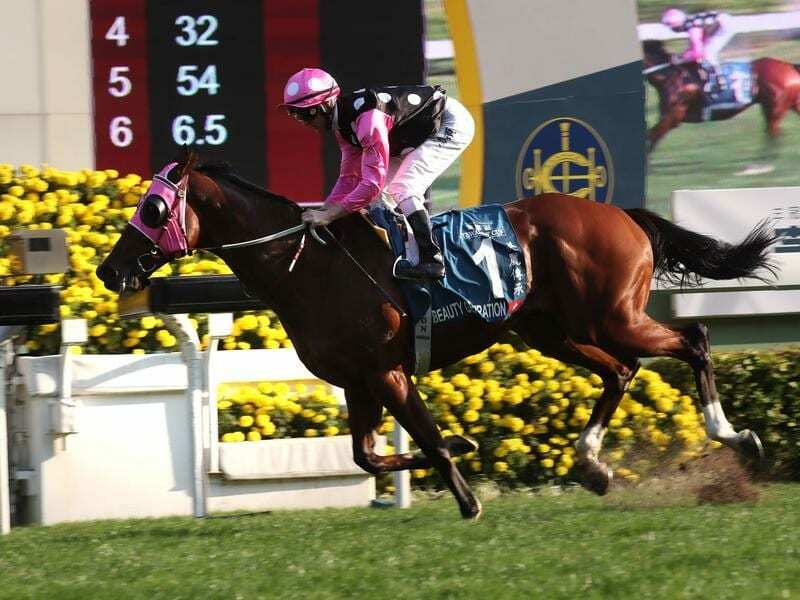 Hong Kong champion Beauty Generation has won the Group One Stewards’ Cup at Sha Tin. John Moore has hailed Beauty Generation the best horse he has trained after the six-year-old claimed a fifth Group One win in the Stewards’ Cup at Sha Tin. Formerly trained in Sydney by Anthony Cummings and known as Montaigne when runner-up in the 2016 Rosehill Guineas, Beauty Generation has an international rating of 127, equal to the now-retired Able Friend also trained by Moore. “He’s the best of the lot,” Moore told the Hong Kong Jockey Club. Jockey Zac Purton said Beauty Generation always had Sunday’s race in his keeping as he scored by three lengths from Conte with Southern Legend another short head third. “He was coasting. There was a bit more there,” he said. “I thought Beauty Generation’s performance last time was better, but he had a bit of a let-up after the Hong Kong Mile and John had him on the way back up today. He’s not far off his top and he’s just shown that. The Stewards’ Cup is the first leg of the Hong Kong Triple Crown but Moore has ruled out stepping Beauty Generation up to 2000m in next month’s Hong Kong Gold Cup. He said the Champion’s Mile was his target with the owner to then decide whether to head to Japan for the Yasuda Kinen.